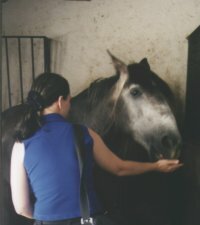 This page is about me, the way I came in contact with the lusitano breed, why I love them and about my horses here in Denmark. 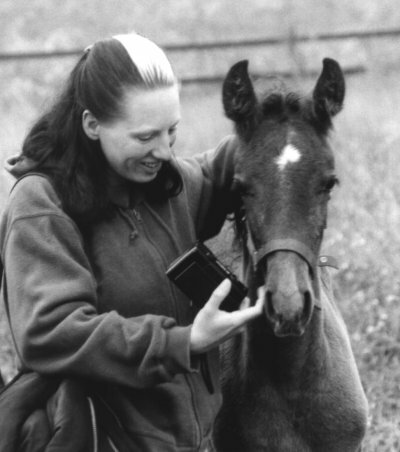 Your contact in Denmark Eva Ørndrup, regarding buying and contacting the Lusitano breeders Rex & Lee Henry. I lived in Denmark in my small flat in the center of Copenhagen. 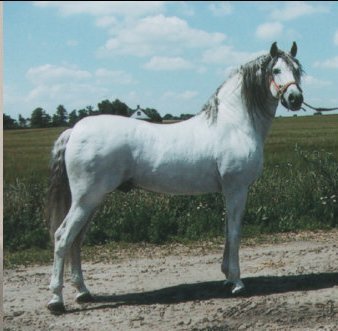 I hope to be breeding both Lusitano as well as Pura Raza Española (Andalusians), in the future here in Denmark on The Iberian Farm (our stud farm yet to come). I still live in Denmark, but now I live in a house just outside Copenhagen, with my husband and children. I don't have any horses right know, but I still hope on getting one in the future. I have been riding for about 14 years, but the first 10 - "do not count", meaning that I was a young girl who just wanted to be near horse and riding them was one of the things I did. 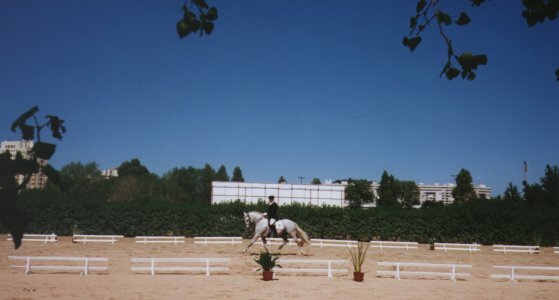 I was riding on a riding school and had lessons, but as a young girl I did not learn the things I learn to day. I just wanted to ride around in the forest and learning to control the horse to go the way I told it to go. But know I learn to bring the horse in balance, to learn the horse to use his muscle the right way and to work with him self. And I learn to use my body the right way, to have the correct seat and to use the work to make the horse flexible and happy about his work. The thing I love in particular - is their huge ability to be collected and therefore, the high classical dressage exercises. In my work for the association for Pura Raza Española (P.R.E.) in Denmark, I try to get the classical dressage in focus also, I think this is the right way to present the P.R.E. horse, when it is ridden in the traditional classical way. We have held some courses about that and other things and we hope to have many more. More and more P.R.E. horses is coming to Denmark, so what we need now are some Lusitano horses, to make it complete. There is no association for the Lusitano in Denmark, I have thought about starting one but I don't think that it would get many members. First of all, the Lusitano is not well known, and there are 2 maybe 5 Lusitano horses in Denmark. I have none, so even I could not show the breed. How can I promote a breed when I can't show the horse and it's possibilities. I hope to promote the Lusitano, with this homepage and with helping eventual Lusitano buyers to my contact, Rex & Lee Henry in Portugal. I bought my first horse in 1997- Claus, he was a ridingschool-horse (at BNR)for about 2-3 years and he is about 12 years old now. I don't have that much information on him, because he was bought without papers and from a horse dealer. I want to ride dressage, especially I want to learn the classical dressage - but this is sometimes hard. First you have to find a teacher and then a horse that are older and more advanced, so that you can learn the correct seat and movements without struggling with the horse. I hope to find one, one of these days. I don't have that much money, so these things like the super learning horse, a farm, private teacher and riding hall, is not in my reach just yet, but I'm working on it. In the meantime, I ride my Claus and we got lessons 1-2 times a week, we tried to ride proper and in balance. He is getting better all the time, but he has his limits, so we will never get to advanced level dressage. But instead I learn how to own my own horse and I teach him tricks and how to behave. He is a bit headstrong and he likes to be in control, but a horse like that is very dangerous, he has kicked several people and he runs from us when ever he gets the chance. I use a mix of Monty Roberts, Klaus Ferdinand Hempfling, Bent Branderup, Sylvia Loch and Morten Thomsen methods and information found everywhere, to train behavior, riding and dressage. I like the idea that it should not be necessary to use force, but at the same time the horse have to respect the owner and people around him. I'm not perfect, but I'm aware of the "wrong" methods and I'm working on understanding the horse better. I found that teaching my horse some tricks like compliments made him happier. My plan is to teach him more tricks and to drive/ride him from the ground. So that his learning and breaking the every day routine, with completely different exercises. * A update on this, is that Claus had some problems whit his right forleg, and I had to put him to sleep. I will miss him and his very strange kind of personality. I bought my second horse, Estrella in 1998 she is a P.R.E. filly born and bred in Denmark, by sire Ural at P.R.E. Opdræt and dam Rocina II at the Grønnevang studboth bought from Spain and in the Cria Caballar studbook. She is going to be grey and then white, probably with a darker mane and tail. We aspect her to be about 160 cm (about 62,9 hands) at least. I hope that she will be approved for breeding and I want her to be trained in the classical dressage methods. She shows promising as a quick learner. We hope when she is approved for breeding, that we will find a suitable stallion, to breed pure P.R.E. 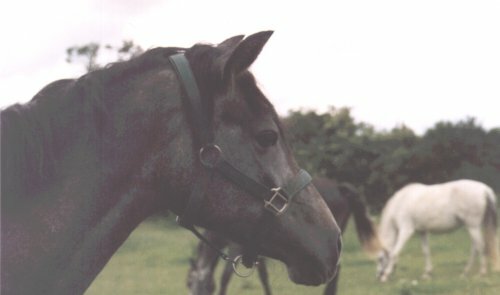 foals, who has height and a very good temperament - some time in the future. I havent have the time yet to break her in or to work with her, but in 2003 I'll get her in training. * A update on this, is that Estrella had the strange disease: wobbler, and I had to put her to sleep as well. I will miss them both and I'm very sad about loosing them both in such a short time. My first trip to Portugal I went to the The Festival International do Puro-Sangue Lusitano Lisbon 96'. Where I was introduced to a lot off breeders and Lusitano horses, by President of the International Andalusian and Lusitano Horse Association (IALHA), Bill Killingsworth. He was so kind to tell me all about the different lines of Lusitanos and the different breeding purpose. 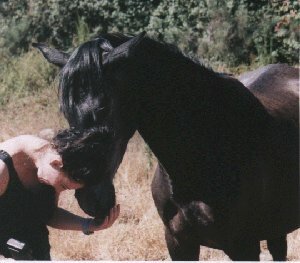 They are usually breed for a particularly working purposes, that is also why I find the Iberian horse so interesting. 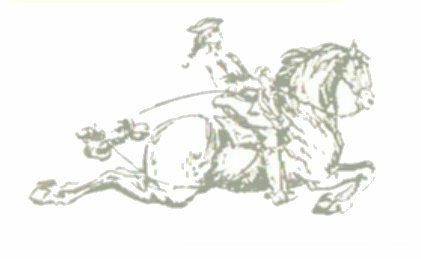 Beside that, they have another quality and their education in Portugal with the traditional classical dressage, bringing the horse in balance and collection, really brings out the best in these horses. 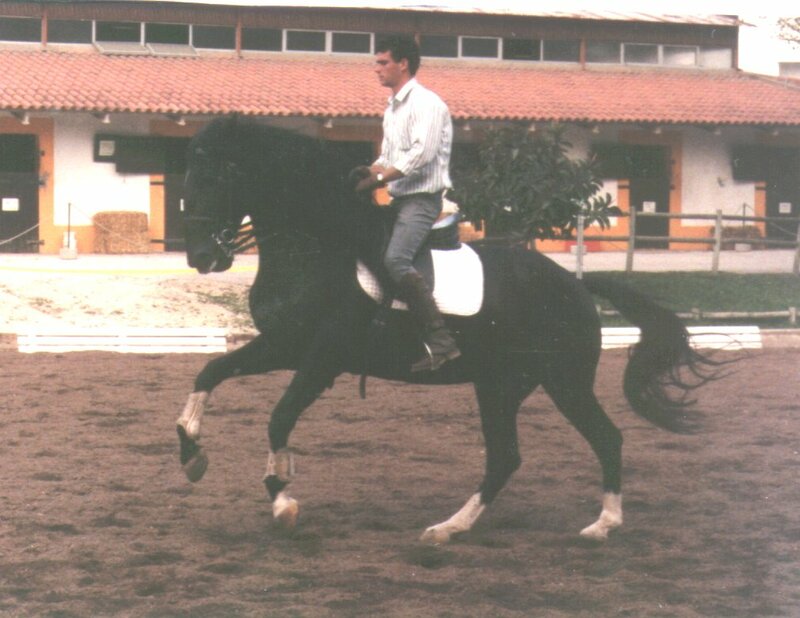 I later heard about all the porblems about having a association and breeding with both Lusitano ( or vise versa), mainly because the offspring's could not be in either the Portuguese or the Spanish studbook register, BUT they are both magnificent horse breeds. Now at last, I was back in Portugal and I was going to see as much of Lusitanos as I could. My boyfriend was not as exceited as I, but eventuel he also, could spot the Lusitano charme and he to love their build and temperement aswell. 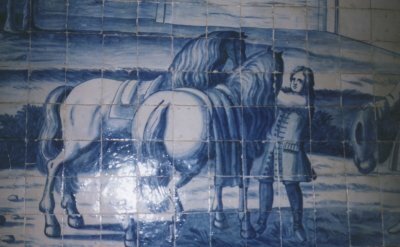 On our way from Lisbon, we drove to the castelses in Sintra, in the Palácio Nacional (the Kings palace) we saw theese lovely azulejos of typical Lusitano (Iberian) horses and the classical riding equitment and style. Surounded by forest, small lakes, green grass and a farytale atmosphere we also saw the Castelo dos mouros, Palácio da Pena, Palácio de Seteais and Monserrate Parque. We recommend a visit it's so ......... farytale like, with beatufull renæssance buildings and the green leaves you feel like you have left the world as we know it, and travelled back in time. 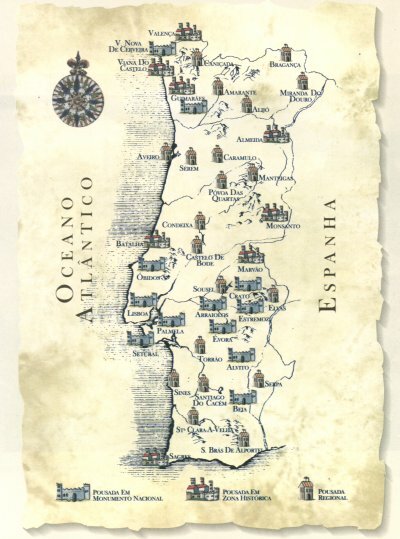 The many azuljas ilustratining Iberian horses, their riders and the magnificent classical dressage movements, show us how important the Iberian horse and the art of riding was in all of Portugal. The war horse, the royal riding horse, the bullfigting horse and the working horse for the farmer and people in general. 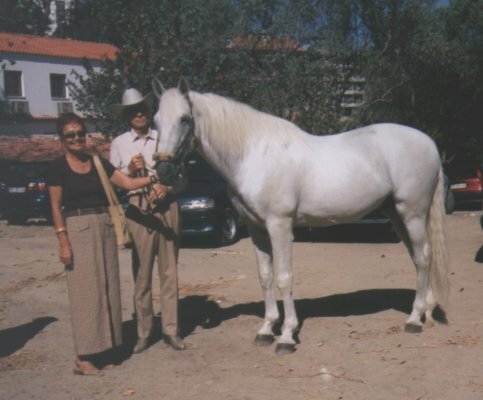 All that is the Iberian horse, therefor also the Lusitano horse's history. That is why this horses is beeing so carefully selected in the breeding. 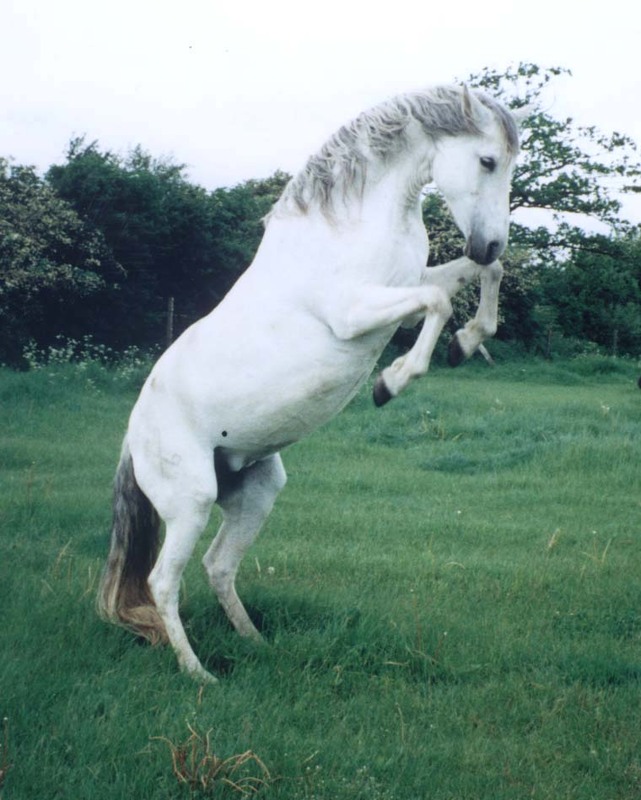 The Lusitano has to be a good worker, light on it's feet, have a lot of power and courage. Otherwise you can not use it in the work with the bull and as a warhorse. It was a HUGE experience for me, I learned alot about the horses and I got to meet so many nice people. Especially The Henrys, and I also meet Rodrigo Matos that was the rider of Their stallion Leon. After seeing all these magnificent Lusitano for 3 days, I especially feel in love with a 4 year old stallion - Jerezano breed by Rex & Lee Henry. The Henrys have been breeding top class Lusitano horses for about 20 years, in Portugal. On my second visit I saw their stallions Xiwara, Leon, Nador and Jerezano at The Morgado Lusitano Training Center ( in Póvoa de Santa Iria). Leon was shown under the rider Rodrigo Matos: gallops-changing, passage and starting movement in piaff. Nador has just started his training and we saw Xiwara( age 20) performing in the Morgado Lusitano show. We also went the dressage compettion in Lisbon, to watch Jerezano again. At first I didn't recornize him, he was almost completely white now. It was just great to meet them again and Jerezano was competing very well. We saw the older colt Nador, he's the full brother of the winning dressage stallion Jerezano, was trained at Morgado Lusitano Training Center. Then we saw some of their mares, on another farm( Casal Branco, in Almeirim) where they have used Xiwara as breeding stallion. We especially noticed the 3 year old filly Oriana, from Alteza, they are planning to train her for riding and show her under saddle next year- she shows promise for dressage. On this my second visit to the land of Lusitanos, I went back without any doubt that I will get a Lusitano for breeding and classical dressage, some day.